Note: Pictures shown are for illustration purposes only. Cleaning products are not included. 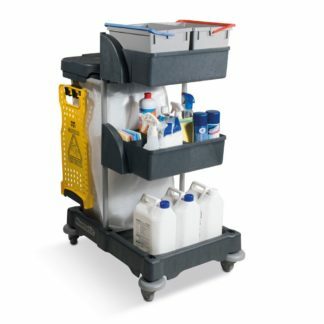 Where mopping facilities are not required, this compact trolley provides maximum storage capacity – allowing for the efficient servicing of offices and other accommodations. The construction is based on our uniquely strong Structofoam chassis fitted with non-marking 75mm (3”) castors, protective buffers, Nutex epoxy coated superstructure, two full-size deep tray units and a pair of 10-litre colour-coded pails. • 120 Litre Waste Capacity – Fully lidded providing excellent capacity for normal waste collection and disposal. • Compact Design – Easy to store and manoeuvre when space is at a premium. • Tray Storage – Two storage trays allow you to carry all your cleaning supplies with ease. • Non-marking Rotating Buffers – Protects walls and doors from bumps and scrapes.